Nokia re-branded their "Nokia Music" service into "NokiaMixRadio". Just one day before the "Nokia Music" event in New York City, Nokia also refreshed their "Nokia Music" application for Nokia Lumia with Windows Phone 8 to Nokia MixRadio. 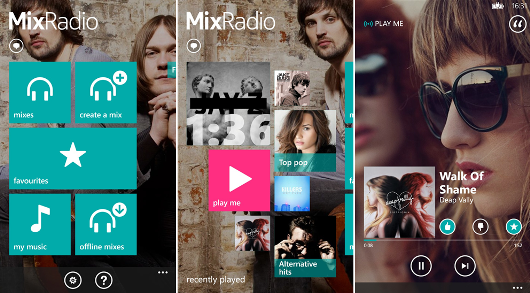 New "Nokia MixRadio" application for Nokia Lumia with Windows Phone 8 is completely redesigned with brand new, fresh and fun user interface and coming with some new cool features to drive you get full music experiences on your Nokia Lumia Windows Phone 8. Play Me is a personalized mix inspired by your unique music profile. Thumbs up / Thumbs down to help refine your music profile. Share mixes with your friends on Facebook, Twitter or by email and SMS. New name and a new look to make it even easier to use.